We played Don't Eat Pete for the first time with the girls tonight. The game is quite popular with my niece & nephews in Las Vegas. For some reason I have failed to introduce it to my kids until tonight. It was a hoot! Really the most simple of games, but thoroughly enjoyable for everybody involved. Sadie's eyebrows shot up with interest when she found out she'd get to eat candy & little Claire caught on to the excitement of yelling "Don't eat Pete!!" & kept yelling out her mumbled version of it at the wrong times. I put Dylan on the task of creating the game board while I cooked dinner. The artist in him couldn't just make it simple. I was really pleased with his illustrations in the end. He rocked it! So we decided to make it a free download for other families to enjoy. We plan on laminating our game board so that it can hold up for future uses. You can download it here, print your own game board & enjoy some good times with your family today! Send the first player away from the game board or into another room, then have the remaining players choose which one of the twelve people on the game board will be "Pete" for the round. Place one M&M in each square of the game board. Have the first player come back and begin picking and eating M&M's from the game board. As soon as the player tries to pick "Pete" everyone yells "Don't Eat Pete!" The player keeps all the M&M's picked up before trying to get Pete. Refill the game board and play again with the next player. You can use cereal or other small snack foods as well as any type of small candy for this game. Wow! How fun. Thanks for sharing. Hey Candace! So Melissa peer pressured me into starting a blog (stephaniereece.blogspot.com) and I have been reading up on everyone all day! My poor kids! Anyways, cute post and cuter game and templete! Thanks Todd family for the fun game! We are off the UT for the weekend and this is just the thing to do while we are there doing "nothing"! i used to take this game to the families i used to babysit when i was a little girl! fun game. i havent played it with my little ones yet either for some reason. great download though, love the kids faces. AWESOME! Thanks Dylan, my kids love you for it! How stinking adorable are those illustrations???!! Love this. Thanks for the download, Candace. Oh how fun and DARLING! Thanks tons for sharing, I'll be linking. i used to play this with the kids I babysat- forgot all about it. Having Dylan's art as our boards will make it especially cool! THANK YOU! And I LOVE LOVE LOVE the picture of Claire all happy and laughy! What a cutie!!! I found a similiar game on Sugar Doodle but it's with the prophets. When someone leaves the room you sing Follow the Prophet and right before they get to the prophet that was picked you say... Don't eat the Prophet! My kids love playing. What a fab idea! I'm going to have to print a copy of this for my children - I've never heard of it before and I love the illustrations! So cute, thank you for the free download, too! I am sure my family will love it! Thank you for sharing! The illustrations are terrific, and this game will be so much fun, especially during our long, long winter. That's so fun! I love the illustrations! So fun!!!!! My boys aren't old enough yet but I'm saving the download anyway because it is toocute! Thank's for sharing! My daughter will love this and the illustrations are so endearing. LOVE THEM! What a great little game! Your little guy did a great job on the faces! What a fun game--I'll definitely be making this. Wow, I'm surprised I've never heard of this game! We are a HUGE game playing family. The simpler, the better, too. I could totally picture this game being more fun that some of the jazzed up electronic games out there! Well, we'll just have to play it to find out! Thanks for the download! i've never heard of this, but i know my kids will love it. Thanks so much and what awesome little illustrations! We have played this game every day since we downloaded your adorable game board. The kids love it and it is simple enough for my two year old son to play. He concentrates very closely as he picks his M&M's by colour! I found you on the Crafty Crow and I have to tell you we love this game!! We downloaded your board and play all the time! Thanks for this wonderful game! The pictures are FANTASTIC! I can't wait to print it out and play it for our family night this week. What a fun game. I will have to try it with my kids. I bet they'll love it! Thanks so much for this game, my boys love it and were in hysterics with nervous giggling. We used crasins as our youngest has a serious dairy allergy. Thank you for the cute download, we put Halloween candy to a good use for our two year old. You just made my kids year...games and Mnm's all in one??? You must be a god! Just blog surfing and I came across a link that brought me to you, thought I'd stop by for a visit. Very cute. I'm looking forward to coming back soon. found you from MyTrendyTykes and WOW!!! what a neat game! My kiddos will love that! Found you via My Trendy Tykes link about this game. It sounds like pure silly fun- LOVE it! Fabulous!! !I love playing this game with my kids. Your illustrations are too cute. I am filing this at thecraftersfilebox.com. Thanks for sharing this! I love the drawings! Hey girl! Love this game!! so fun! thumbs up! We love Don't Eat Pete so much that we made an App for it for Android! Check it out, it's free! my kids beg to play it all the time, and since it is on a little computer, there's no sugar involved. Love, love, love! Thank you for the print out! We did this last night and the kids L-O-V-E-D it. We were trying to learn a primary song so we sang a verse really loudly each time to call in the person from the other room. It worked really well, thank you! 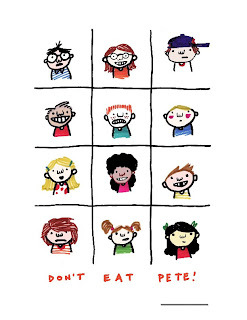 Just found this "Don't Eat Pete" printable. We used to play this with the families we were teaching on my mission in Portugal (except we called it "Nao coma Roma"). I'm excited to play this with our Joy School class today.